$5.00 Off Premium Handmade Boxes! 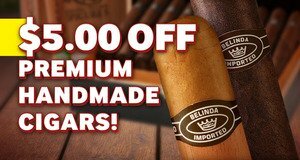 Get $5.00 Off select boxes of Belinda Black, Belinda, Bering, Moroceli cigars! The JR price has been reduced by $5.00 Off!